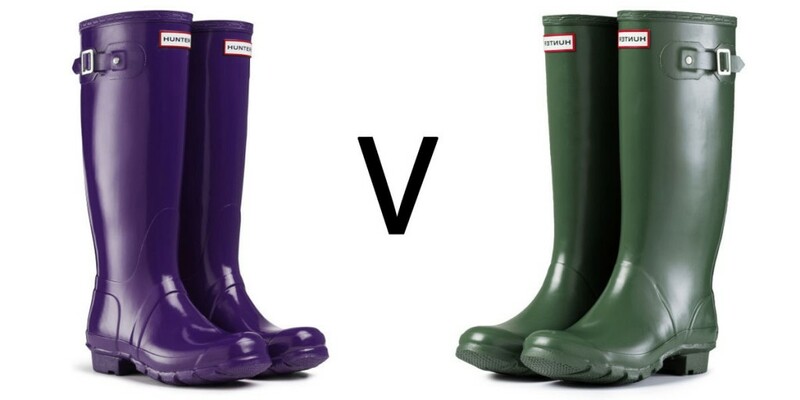 Home Clothing Hunter Wellington Boots Gloss vs Matt – A Fashion Dilemma! You can’t beat a pair of wellington boots to take you back to your childhood – memories of splashing around in puddles, getting magnificently muddy and then trying to conceal the evidence while you’re being told off for bringing mud in the house. If only life were still as simple! Now, Wellington boots have a large stake in the style rankings, so they have to look good as well as being puddle worthy. 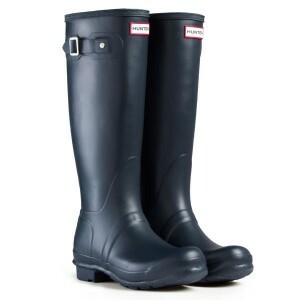 Hunter is the king of the wellington world, not only have they become a style staple among fashion gurus, but people are now genuinely excited to see it raining just so they can pull-on and show-off their Hunters! The Hunter brand is renowned world-wide for high quality; man, woman or child you will find a pair of wellies that are created with you in mind. So the question on every welly-wearer’s lips; Hunter Gloss or Matt? I have not been this perplexed since my quilt or wax jacket decision! You don’t often find patterned Hunter wellington boots, so if you want ceremonious, stand out style, the Hunter Original Gloss are probably your safest bet. The gloss effect really makes the colour pop and they absolutely ooze shine, perfect for the magpies among us! Our favourite for this season are the Hunter Original Gloss in Brick; you can envisage the burnt-orange Originals kicking about in the al dente autumn leaves or on the feet of a plump pumpkin on Halloween! We also can’t forget the Hunter Original Gloss boots in delicious Dark Ruby; the colour of a bursting berry, you quite literally want to eat them – although that is not recommended! The glossy shine ultimately adds an element of elegance; however, is it the case that dirt is more prominent against that high-shine finish? Some wearers find that the Hunter Original Matt boots are better if you are likely to get mucky, as they are better at disguising dirt or grime. We can see their point; you can imagine the Original Gloss starring in their own rendition of ‘Singing in the Rain’, but not so much in a murky, muddy field. Although, it is argued that the Gloss are easier to clean, so it depends what’s important to you. Other than the potential to disguise dirt, some people simply prefer the look of the matt wellies, especially if you favour a more subtle boot. Also the matt wellies are more prone to ‘bloom’; this is a natural occurence where a white powdery substance appears on the surface of your boot. This is because rubber is a natural product and in certain conditions, insoluble particles may rise to the surface. This is a normal process, characteristic of high quality, natural rubber and can be rectified easily with the Hunter Boot Buffer, although some people find the bloom adds a rustic appeal to the welly and it does no harm to the durability or effectiveness of the boot whatsoever. The Hunter Original Tall in Navy (pictured below) would go with anything and because they are matt, they almost have a leather-look finish. 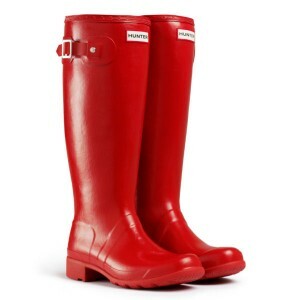 However choosing matt does not mean you have to compromise on colour; these Hunter Original Tour Boots in Red (below) will almost have you believing you’re in an episode of Williams Wish Wellingtons – however, unless your wish is to own beautiful boots or have dry feet in the rain, we can’t promise they’ll make your wishes come true! These are also extremely flexible; they can be rolled up and packed into their own drawstring bag, perfect if you need your wellies on the move. If you don’t really mind whether your boots are glossy or matt; you just want that little extra addition to make your boots unique, check out our range of Hunter cuffs and socks – cosy, charming and fun! Hopefully this has given you a helpful insight into the gloss/matt wellington boot dilemma, now just to decide which colour to go for…? 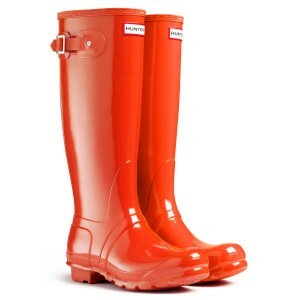 gloss wellies, hunter, hunter boots, hunter cuffs, Hunter gloss, Hunter Matt, Hunter Original, Hunter original gloss, hunter original matt, Hunter original tall, Hunter socks, Hunter tour boots, hunter wellies, Hunter wellington boots, Hunter wellingtons, matt wellies. Bookmark.